The second book in the Crown Service series, BLADES OF ILLUSION, is now available for pre-order on Amazon. 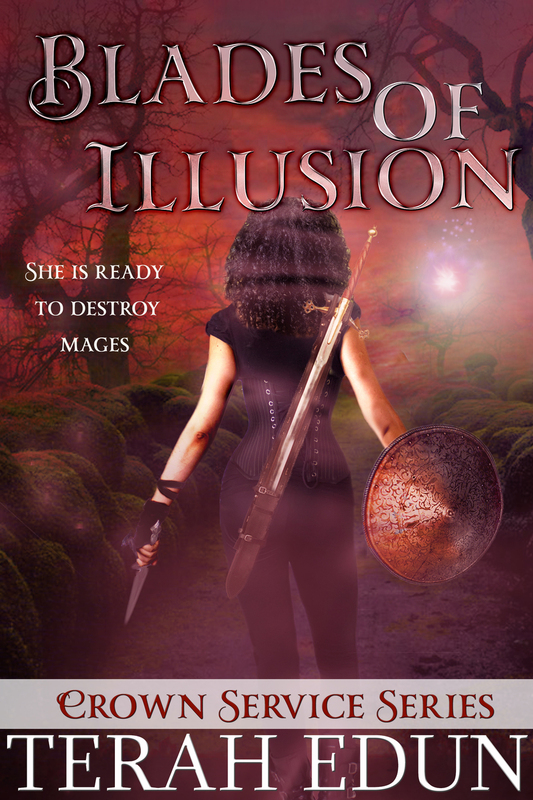 Not only is Blades Of Illusion on pre-order, but the prequel BLADES OF MAGIC is temporarily free. Yes, you read that right. But by Wednesday night, it will be back to paid. So I suggest you download your free copy today and start the Crown Service series. For those who haven’t read Crown Service, it follows the journey of a battle mage and young woman named Sara Fairchild determined to uncover her father’s crimes. But nothing is as simple as it seems and as she bumps into dark groups along the way, she learns that perhaps her father’s crimes weren’t as obvious as it would seem. Crown Service is set in the Algardis Universe and begins a few hundred years before Courtlight starts. (312 pages) Sara Fairchild, duelist and combatant, is out for vengeance. Her father was betrayed. Her mother is dead. All she has left is her desire for revenge and a quest for answers. Now a member of the Mercenary Guilds’ elite guard, she fights on the front lines of her empire’s first civil war. But Sara’s priority isn’t winning the war for the crown or empire. It’s finding out the true circumstances of her family’s downfall while keeping one mild-mannered curator alive. As emotionally detached as she is from everyone around her, Sara can’t seem to shake the stubborn affection of her one friend. When she stumbles upon the secrets of not one but two Kade mages, she soon finds out that neither of their lives is worth anything to either side. As she fights to outmaneuver a group of fiendish imperial assassins and win a war that grows more complicated by the day, Sara Fairchild knows that no matter what, the empire will never be the same. Sara Fairchild had no idea where she was. Neither did her captain or her fellow mercenaries. Oh, they had a general idea. A vague notion of the direction in which they needed to head to get to the battlefield. But frankly, it wasn’t a battlefield that she was sure she’d ever see. With the time passing quickly, she had lost all faith in the abilities of the commanding team to lead them to their rendezvous point. She hadn’t much respect for them after finding out in the worse way possible, that the captain she trusted, the captain they all looked up to, had decided to take evasive actions that left the bulk of his unit stranded under a deadly hail of battle fire and poisoned arrows. Arrows that dissolved your flesh if they didn’t kill you outright from the impact. The man who was supposed to have been the leader that she could look to. But not just her, hundreds of other mercenaries had looked to him. Instead they had died for a man who sacrificed them for the greater good. His greater good. Captain Barthis Simon had led his elite third division away from the whole of the Corcoran mercenary marching unit in case of an attack by the Kade mages in the dead of night. The betrayal stuck in Sara’s gut like a massive knot that wouldn’t unravel. His actions went against everything she had learned. Every core value of honor and service her father had instilled in her. Simon was supposed to have been responsible for every man, woman, and child who served in all seven divisions of the Corcoran guard. From the littlest of the runners, orphans that she had mockingly taken to calling ‘Cams’, to the dozens of archers, smiths, and fighters under his charge. With a little smile, Sara remembered the youngest of the Cams’, as in Come here ‘ams, that she had run into. He couldn’t have been more than twelve with knobby elbows and knees and spindly black hair, the kind that a mother would set straight with a dash of water and a quick comb through until it fell flat against his skull in damp submission. That is, at least until he managed to find a way to scruff it up again minutes later. Sara hadn’t labelled him or any of the other younglins’ Cams’ because they shared the exact same name as any of the other orphans. No, she called him and his fellows Cams’ because all the young charges of the guild shared rhyming names like Rams and Vams courtesy of their mercenary caretaker, an archivist with a biting wit whose name she had yet to learn. Hell, she wasn’t even sure if the old caretaker was still alive. He hadn’t served in just one division, which would make the question of his death or life so much easier. He was one man who crossed all regimental and divisional boundaries as an administrator and overseer. But Sara knew he was more than some detached flunky. Instead of acting solely in the capacities of his office, she had seen him take charge of all of the orphans, include those younglings that were the least of the guild. And yet, in her heart, Sara felt the loss of the orphans more than any of the warriors slain on the battlefield. It was worse in a way she just couldn’t put a finger on. She smiled grimly. It was hard to put into words like many of things she had lately experienced. The violation of her mother’s corpse at the hands of a necromancer was a similar instance. The memory filled her with indescribable rage and unabashed sorrow. Sara may not have been able to put her feelings into perfect words but she felt the loss in her gut like a punch to the stomach. She knew that sickening feeling was because their young lives had been snuffed out before they’d ever had a chance to truly experience what it meant to be alive that she felt so much sorrow. She knew it wasn’t right. Everyone deserved a chance to live and experience life as it came. In a way, the adults of the guild knew what they had signed up for. For glory. And for death. They may not have expected death in such a manner. So gruesome. So painful. But they knew death was coming for them, in some manner, at some time. But what child knew that the shade of death stood on their door? What child understood that from one day to the next they would never see the sun rise again? Pre-order BLADES OF ILLUSION today & read on your Kindle the morning of release! Want to read a very special and brand-new short story of Katherine Thompson? 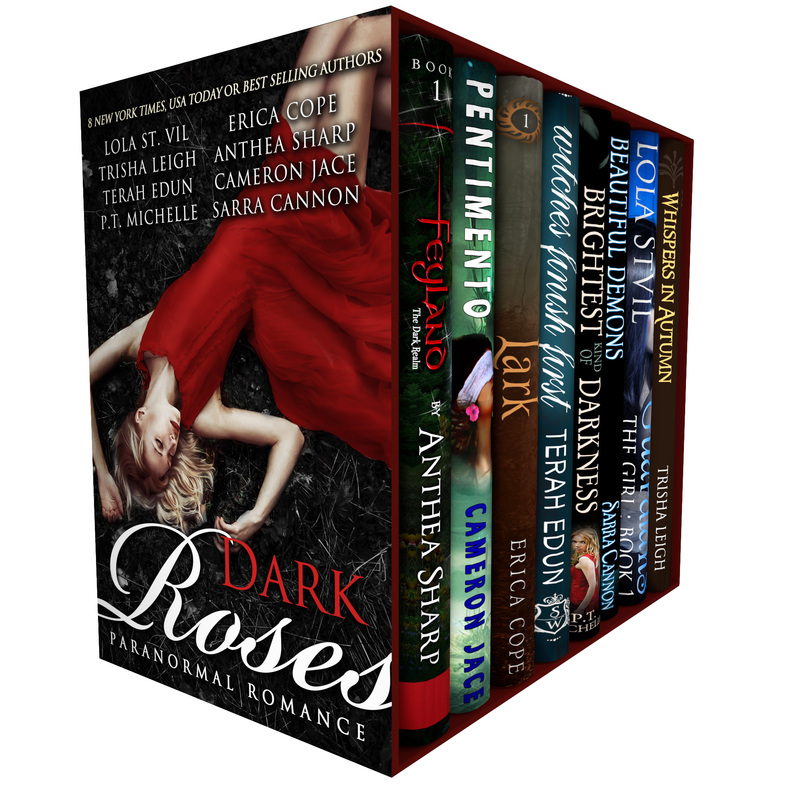 Time to pre-order DARK ROSES which includes Witches Finish First! Buy it via pre-order today! Sale price of $0.99 guaranteed.